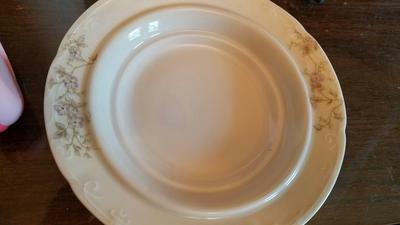 I inherited a set of dishes from my grandmother (cups, saucers, plates, serving dishes etc) that were given to her second hand when she got married (in the late 20s or early 30s in either rural Missouri or Kansas). We tried to find out information on them, an antique dealer took a saucer to "research" it then went out of business and disappeared (and I never saw the saucer again). What I really hope is to identify them to find a replacement saucer. 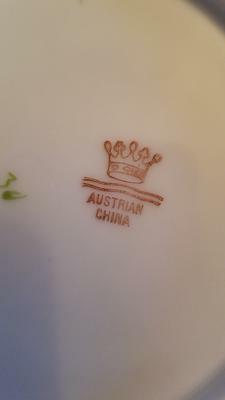 The mark is a crown with two wavy lines under it, and the only words are "Austrian China" written under it in a brown-ish color. I doubt they are worth much. I've tried several times over the years to locate some info on them (I'm pretty leery now of taking it to any "dealers"), and always come up with nothing as the mark is so ambiguous. This an interesting query because, yes, it is a mystery as I have not seen this mark before, and there are no other examples anything like it that I could find in my research. The wording (using the word "Austrian" rather than "Austria") is an absolute home run in terms of research as it really narrows down how many of these examples there are around. The answer is, the only mention of a pottery marking using the term 'Austrian China' is seen only once on the whole of the history of the internet. I did an advanced search which pulled up the specialist site www.porcelainmarksandmore.com which had a different crown mark using this term plus the word 'Venice'. 'Venice' might have been a reference to the pattern, but there were no examples of the ware, just the mark. This was the only mention. What does this tell us? It tells us this is a very obscure mark. My tentative guess is that this marking was on china imported to the US during the 1950s from Austria by a distributor selling to local stores which featured china and glass products. To find replacements, if you have already tried replacements.com, is to raise a search on eBay and have them email you every time something with the specific keyword "austrian china" comes up for sale. My mom has a 5 inch by 2 inch trinket box that has the same marks. It is emerald green with gold trim. the cover has a naked baby holding 2 strings of flowers. The inside is white. I am trying to find out anything I can about it but not having much luck. If you have found out anything about maker or the mark I would appreciate the info.